Thank you for visiting our Career Paths page – here we can show you all the different career paths you can follow as an employee of CoreCivic, whether you are an experienced professional, a State, Federal or Government agency employee, a transitioning Military Veteran or a new graduate looking to start your career we have a path to success that fits you. CoreCivic is dedicated to bettering the public good. Our employees have careers in Secure Corrections, Community Corrections, Property Development and Management, Finance and Accounting, Human Resources, Information Technology, Education, Nursing and Professional Medical and many more career opportunities that support the CoreCivic mission. CoreCivic employees can choose to follow a variety of career paths. 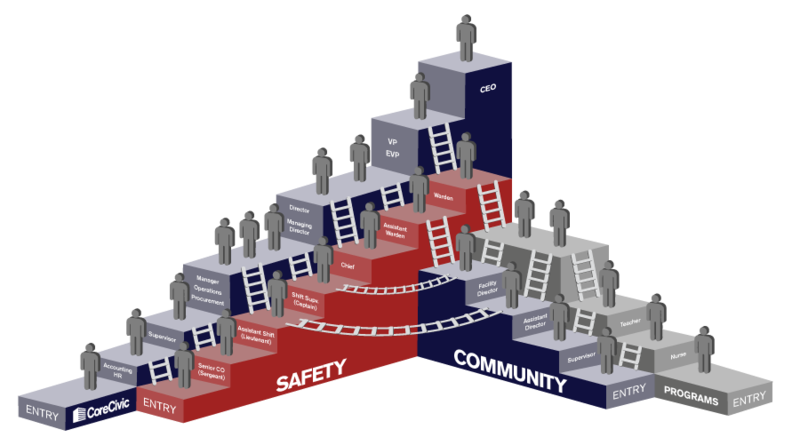 Starting in Safety, Community, Corporate or Programs, you can chang paths several times in your career at CoreCivic. We have programs and medical staff who have transitioned in HR or Operations, wardens who are now in corporate roles, and a CEO who joined the company as a correctional officer. Find your path to succes at CoreCivic.